We hate things cluttering the kitchen counter. Less is more for us when it comes to our counter tops and we therefore endeavour to put things out of sight (not including our Kitchen Aid mixer, who has under counter space for that behemoth?). 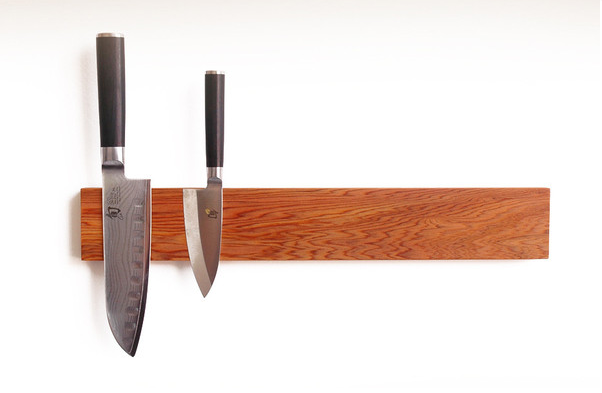 As for our knives, we absolutely adore the professional kitchen look of the magnetic rack. We are especially found of this one for being made from reclaimed old growth Cypress or Redwood. Obviously, hidden inside somewhere there are some powerful magnets, but we love not having to look at them. Available from Uusi here.